This sunday is the 10th anniversary of the terror attacks of September 11,2001. 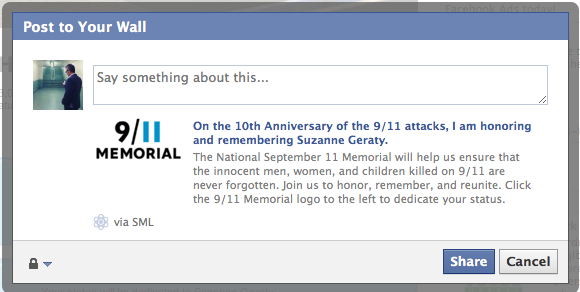 On Wednesday, Facebook in collaboration with The National September 11 Memorial & Museum has released its new 9/11 Memorial app to dedicate their profile pictures and facebook status to more than 3,000 innocent people who lost their lives. “The goal of the application is to honor and remember victims of this devastating attack on America, 10 years later,” Involver Senior Vice President of Marketing Jascha Kaykas-Wolff said in a statement. When a you posts a photo or send a message, application will randomly select and dedicate a status to any single victim out of the 3,000 victims. You can even choose and dedicate an update to a specific individual. The National September 11 Memorial & Museum was founded in 2005 to oversee the design and construct of the memorial and museum at the World Trade Center site. This organization will opened on 11 september, and the museum will open in 2012. Lets honor and remember the thousands of innocent men, women, and children who lost their lives in that horrific attacks of February 26, 1993 and September 11, 2001.